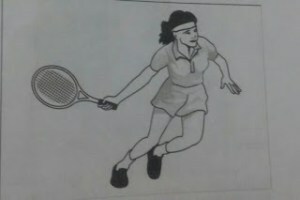 Browsing Category "Psychology in SSB interview"
Hello everyone, this is an Sample PPDT practice set on A Woman demonstrating tennis . This is a part of PPDT Practice set , which may come across during your SSB Psychological TAT or on SSB Screening PPDT. I have also uploaded many sample psychological PPDT and TAT stories for your preparation earlier. Practice more and more for better practice. Bina was a renowned tennis player due to her remarkable career record. She had won a number of titles during her illustrious career. Bina was highly experienced and possessed great technique of the game. She therefore, established coaching institute after her retirement to train the enterprising youths of the country. Her ultimate aim was to produce players who had the potential to represent India in the forthcoming Olympics. Hence She motivated the candidates and also trained them in specific technical aspects and the most noteworthy areas of tennis. Her coaching was extremely strategic to put psychological strong hold on the opponents through their best performance. Seeing the standard of the passed out candidates of her academy, the reputation of her academy got enhanced tremendously and hence better candidates joined her for coaching. Now was the opportunity for Bina to prepare players for the Olympics team . With her hard work, dedication and skill, she produced a good team which performed very well in the Olympics. This gave deep pleasure and satisfaction to Bina. There was a remarkable contribution of Bina to bring India into limelight in international Tennis. Arjun is keen to become a good swimmer and he is going to take part in the aquatic championship at the district level and wanted to take guidance and work under the expert swimming coach Vikram. One day when he is in the process of swimming and wanted to extra length but, but due to the heavy flow and fast current he lost his balance. He tried to regain his balance but of no avail. He developed some cramps and running short of breath, he raised his hand and started yelling for help. Vikram immediately drive into the river and tried to catch Arjun. But due to fast current of water, and with great difficulty he is able to do so, pulled Arjun to outside the river and took him to the bank of river. he arranged his first aid evacuation and medication and ensure his fitness Vikram is very happy and satisfied that he is not only able to save the swimmer but also advised and guided Arjun to built up his physical stamina to meet such eventualities. Arjun after recovering took extensive practice come out with flying colors in swimming championship, by putting extra effort and improving his swimming skills. Women now days are generally more abreast about modern development and skills irrespective of traditional taboos. Madhu come from an uneducated family, though she had gone through the college. But unfortunately she is not allowed to work, and before that she got married and as the nature goes, she soon became expectant mother. But Madhu is never coward and wanted to earn a living to herself. She took a firm decision and decided to take up a job as soon as she became mother. So she started planning for it, she read many books became generally more aware by reading news papers and magazines and tried to grab opportunities coming her way. She left no stone unturned and finally her dream is fulfilled. She joined a non-government organization with consent of her family members. Not only she brought prosperity to her family, but made the people aware in the village to help the girl students to take up studies and find jobs which will result in prosperity and development of the nation. Guys This is one of most Important section of Psychology Test in SSB Interview. I have been continuously asked how to write TAT story on a blank picture. This is one of most effective way to write a Blank slide i founded. Guys i am putting this TAT story to provide you better understanding of how to write a TAT story on A lady in Open Village Area. Leena is studying in B.A. III. During her vacation she visited her village. The outskirts of the village were lying barren with no cultivation. Deforestation is removing the tree line. She found women folk pulling log of wood to bring it to their home. On enquiring she realized that felling of trees is being used in kitchen for cooking purposes. She asked them not to use it, since it not only create breathing problems, but also resulted as deforestation. Leena thought over the problem, and wanted to find solution by introducing the essentials of solar cookers in the region. Firstly, it will result in healthy cooking and living, and there by stop deforestation in region. Leena, visited the village area, educated the masses and captured the essentials of the sun rays for cooking which is cost effective. The point is well taken by the villagers. Leena brought awareness and prosperity by introducing good and healthy living. The stimulus depicts a village girl seeking ways and means to improve the general living conditions in the surrounding areas. The female is well read and achieves her mission in education the villagers about modern techniques and use of solar emission to bring changes in the existing circumstances leading to deforestation and smoky outfit. The pint is well taken and the mission is productive. Guys i am focusing of TAT stories having addressing Scene again this is because these are most commonly asked stories in Psychology: Thematic Appreciation Test-TAT. In this post i am writing a TAT story on a person addressing villagers on essentials of health and Hygiene. you may prefer my previous stories for better practice. One of my classmate asked me to write a TAT story on this picture-A lady with Pitcher in her Hands. When i say this TAT picture first time i got confused that how to write on it. It took me some time to write a sample story on this scene. I have putted the same for you. Sadhna is transferred as a collector of Mathura district. While visiting various places, she observed that number of pilgrims is very low at a particular Ghat. She inquired the reason and found that the stones were too any, which result is lot of miss happenings. She decided to overcome it. Initially she got removed the broken stones, made arrangements for seating on both sides of the Ghat. The main entrance to the Ghat is given face lift with cementing and proper stairs to bath and reach the water. Separate enclosures were made to cater for men and women. Funds were raised through social organization and government support. Special appointment of expert divers is catered. She also got arrangement of different cultural activities of different states. Now the number of pilgrims is started increasing. She is happy that proper utilization of the existing resources and volunteer effort of the people, helped her staff to later to the heavy traffic and people and revenue started flowing to the agencies for further development. Guys i have putted a TAT story earlier of how to write a tat story on a person addressing villagers Under a Tree. This time Again I am putting, how to write a TAT story of a person addressing a group of children under a tree scene. This is most common TAT picture asked in Psychology section of SSB Interview. Inderjeet is a social worker. After his post graduation he visited the village near to his city. He found that people were illiterate in great number. He decided to educate them by imparting basic teaching. He met village Sarpanch, and addressed the village gathering. He gave the people the importance of education. People agreed and showed their desire for learning. He started from the basics of literacy, i.e. reading, writing and arithmetic. After a continuous and regular hard work now 90 per cent villagers were literate. After completing his task, he moved to another village and applied the same procedure. He realized that in a short duration of few months, many people had been educated. The village and the community became prosperous. Inderjeet did not stop. He encouraged the remote villagers to read regularly informed them about the opportunities provided by the government towards literacy campaign and free education for the children. He achieved his aim with dedication and devotion.